A myth in the ancient "Records of Tango Province" says that the deity Izanagi-no-Mikoto created a bridge to connect heaven and earth, but when he fell asleep on earth the bridge fell into our realm. However, many different fish and shellfish still live in both bodies of water created by the falling bridge. 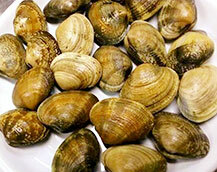 These clams are grown using traditional methods in the Aso Sea, where there are abundant plankton due to the nutrient-rich waters carried in by rivers.The clams are said to be best in May and June. 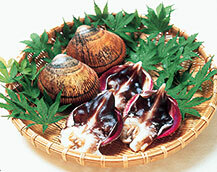 The tango torigai, or Japanese cockle, is a Kyoto-brand certified product due to its size and unique taste. 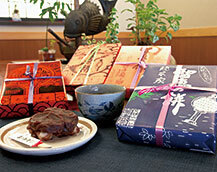 Lunch restaurants called torigai hirudokoro start serving them from late April until whenever their stock runs out. 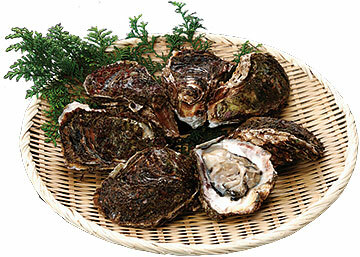 It is said that the oysters' savoriness increases over the summer, so they have a much richer taste than oysters harvested in the winter. 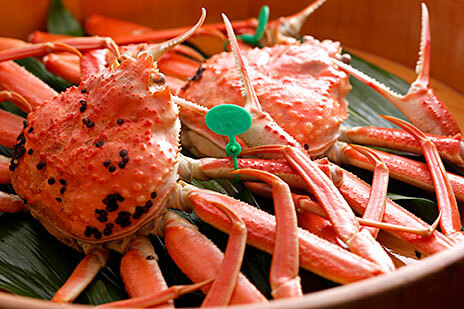 Snow Crab, caught in fishing areas deep in the Sea of Japan, is called the King of Winter due to its size and taste. 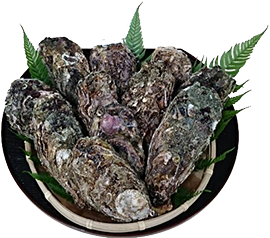 This natural oyster from the plankton-rich Aso Sea of Amanohashidate is rich in zinc, taurine, and glycogen. Along with snow crab, yellowtail thinly sliced and shaped to look like a flower is one of Miyazu's specialties. 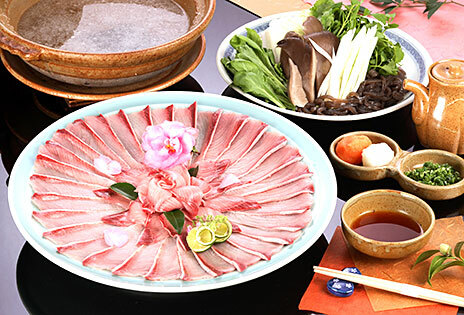 Yellowtail hot pot is available from December to February in local restaurants and hotels. 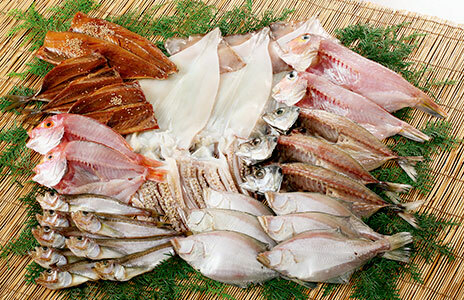 A Tango food heralding autumn, bigfin reef squid sashimi is almost transparent. It is considered the sweetest of all squids. 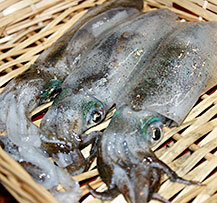 Drying the squid for one night increases its sweetness. One night dry increase sweetness more. It is hard to come by a white meat fish with such a deep and refreshing taste. 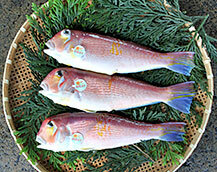 The red tilefish is considered one of the indispensable ingredients in Kyoto cuisine. Served in four shops in front of Chionji Temple. A special food created in the Kamakura period (about 700 years ago), they are said to bestow the wisdom of Manjushri. They can be purchased as souvenirs or can be enjoyed fresh in-store. 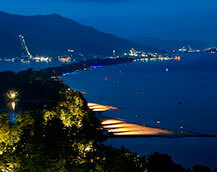 A winery and vineyard is located on the northern shore of Amanohashidate. It offers a variety of wines, the tastes of which vary from fruity and sweet to crisp and dry. 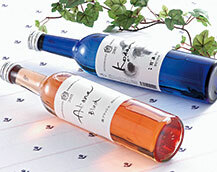 Its wines have won awards for a continuous eleven years at the Japan Wine Competition. Legend has it that there was once a fierce battle between the Monjudo Bodhisattva who came from China and an evil dragon that had harmed Tango's seas. This battle is reenacted on a specially designed floating stage. 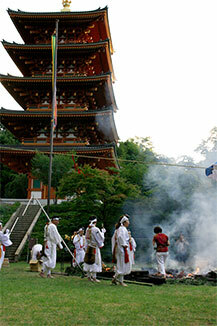 Moto Ise Kono Shrine's festival boasts a rich history, and here guests can enjoy traditional entertainment like sacred shrine music or sword dancing. 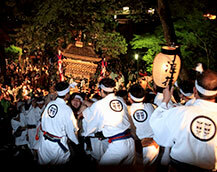 Held simultaneously at Sannougu-Hiyoshi Shrine in the west and Wakinomiya Shrine in the east, this festival was first celebrated in the Edo period. On the last day of the festival portable shrines are carried around the city to the cheers of onlookers. This event features a fantastic night light up. Each Sunday from July 15th to August 19th Various illuminations decorate the area from the station to the pine trees on Amanohashidate. 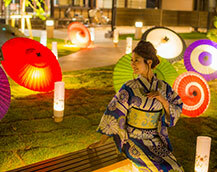 Japanese umbrella lights, paper lamps on streets, and illuminated pine trees are just some of the features. 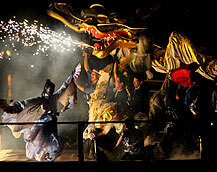 This dancing dragon performance by local young people has its origins in a myth from Chionji Temple. 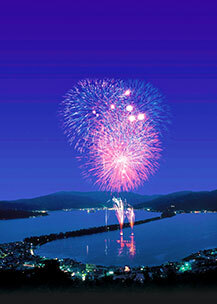 Guests can also enjoy a fireworks display. A visit on this day is said to bestow the same amound of luck as a thousand visits. 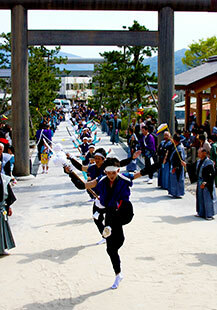 This is a traditional Miyazu dance competition between different local councils, companies, and other groups. 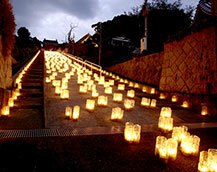 One of the most famous floating lantern events in Japan. 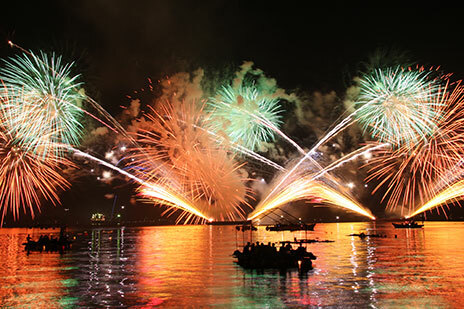 Floating Spirit Ships surrounding 10,000 Chasing Lanterns on the surface of Miyazu Bay, and 3,000 fireworks must be seen. This is a walking event held on the streets of the Teramachi area of Miyazu, which boasts a traditional Edo period townscape. 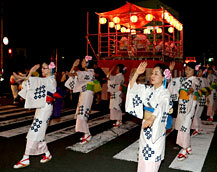 The streets are illuminated by 10,000 lanters and there are various different stalls and musical performances. 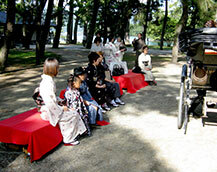 Various events like a kimono fashion show, raffles, and stamp card races are held during this festival. 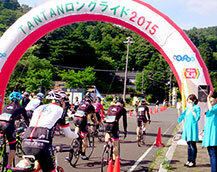 Anyone who preregisters can participate and be dressed in a kimono. FThis firework show heralds the beginning of winter, and on this night over two thousand fireworks light up the clear autumn sky.